The link between saturation media coverage of mass murder, spree killing, jihadi attacks and copycat crimes is well established. It must stop. News-media organizations that persist in literally glorifying these villains beyond any reasonable news value are complicit in encouraging further crime. They know it. That fact has been established by the medical and law-enforcement communities. Jews for the Preservation of Firearms Ownership, along with a growing list of national co-sponsors is encouraging the journalism industry to cease and desist from repeatedly flashing the names and faces of mass murderers' and jihadis' in their reports. You can join this effort---and help make America a better place. Join with us. You don't have to be Jewish to work with JPFO, you just have to love liberty. of mass murderers' names and images." 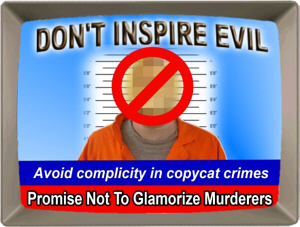 Three easy steps and your organization can join in calling for an end to mass-media glorification of mass murderers. Print the statement on your letterhead as a testimonial, make it a company policy, have your participation recognized in local media. It's all spelled out. Send us a copy to help promote you and your support. Click here to learn more. (Coming soon!) More and more journalists and experts are calling for an end to mass-media promotion of criminals and mass murderers. It doesn't matter if they join with JPFO or figure it out on their own, these are champions of safety, ethics and human decency -- take a look at their fine work. Volunteer to help us gather them all. (Coming soon!) With no concern for the damage they do, the lives they cost or their immoral behavior, mass-media outlets persist in promoting detestable villains by name and image. Here is a rogues gallery of the worst---pandering for dollars and the lowest dregs of an audience. These people and outfits have earned your scorn and derision -- including network and cable TV stations, major newsprint outlets, national magazines -- all of whom promote vicious killers. They perpetuate mass murder, use it to attack your right to arms, and they must be stopped. Don't let them get away with promoting murder.